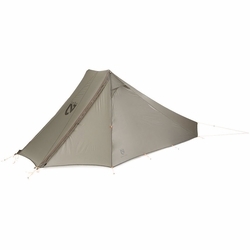 NEMO Spike 2P Tent. Designed with guidance from professional backcountry hunters and anglers, the Spike™ 2P trekking pole supported shelter is meant for exploration off the beaten path. Large entry door can be supported by trekking or tarp poles (not included) to create an awning. Unique design allows for setup with two trekking poles. Reinforced pole pocket with attached pole sleeve house the trekking pole handle.